5.3 earthquake hits the Island of Hawaii. 5.0 earthquake hits Kepulauan Babar, Indonesia. In the Western Pacific Ocean: Super Typhoon (ts) 31w (Yutu), located approximately 391 nm west-northwest of Navsta, Guam, is tracking westward at 13 knots. Jordan – At least 18 people have been killed in flash floods near the Dead Sea in Jordan, most of them in a bus that was swept away. The bus was carrying 37 pupils and seven members of staff to the Zara Maeen hot springs area when it was washed away, officials said. Turkey – Turkey’s state-run news agency says six migrants have drowned after being swept away by floodwaters as they tried to illegally cross into Turkey from Syria. Anadolu Agency said paramilitary police and rescuers recovered the bodies of six people Thursday near the border town of Yayladagi, in Hatay province, following severe flooding. Russia – Floods have left two people dead and two others injured along with one missing in the Tuapse district of the Krasnodar Region, parts of which were hammered by severe storms. Kenya – A nightlong downpour has flooded parts of Mombasa city, causing huge traffic snarl-ups. The heavy rains, which started on Wednesday night, have caused flooding and poor visibility. Motorists struggled to steer vehicles through flooded roads on Thursday morning. Some residents had to wade through flooded sections of the roads. One of the most powerful Pacific hurricanes on record obliterated a remote Hawaiian island, causing an important turtle nesting site to disappear in early October. Former Category-5 Hurricane Walaka was still packing Category-3 force just before it struck the remote French Frigate Shoals, about 400 miles northwest of the main Hawaiian Island of Kauai. Storm surge wiped out East Island, which is a critical habitat for green sea turtles, monk seals and various types of sea birds. University of Hawaii researchers who were studying the wildlife were forced to evacuate the island before Walaka struck. In the Eastern Pacific Ocean: Tropical Depression Fifteen-E is located about 1140 mi…1840 km wsw of the southern tip of Baja California with maximum sustained winds…35 mph…55 km/h. Present movement…w or 280 degrees at 14 mph…22 km/h. In the Central Pacific Ocean: Tropical Storm Lane is located about 255 mi…410 km wsw of Honolulu Hawaii and about 220 mi…355 km ssw of Lihue Hawaii with maximum sustained winds…40 mph…65 km/h. Present movement…w or 260 degrees at 8 mph…13 km/h. Taiwan – Update – Six people have been killed by floodwaters in Taiwan, officials said Saturday, after days of heavy rain forced thousands to evacuate their homes. More than 6,000 people were evacuated with more than 1,100 still in shelters on Saturday morning. Hawaii – Update – Tropical Storm Lane drifted away from the Hawaiian coast on Saturday as lingering showers spread across the island chain, threatening to trigger more flooding and landslides. In the Western Pacific Ocean: Tropical Storm 22w (Soulik), located approximately 317 nm west-northwest of Misawa, Japan, is tracking northeastward at 30 knots. Tropical depression 24w (Twenty-four), located approximately 58 nm west of Taipei, Taiwan, is tracking westward at 16 knots. In the Eastern Pacific Ocean: Tropical Storm Lane is located about 135 mi…220 km ssw of Honolulu Hawaii and about 190 mi…305 km sse of Lihue Hawaii with maximum sustained winds…65 mph…100 km/h. Present movement…nnw or 335 degrees at 3 mph…6 km/h. Hawaii – Powerful hurricane Lane that already has dumped more than two feet of rain on parts of the Big Island is expected to keep soaking the state through the weekend, exacerbating dramatic flood conditions as residents hunker down and wait for the storm to pass. Officials downgraded Hurricane Lane to Category 2 on Friday morning but say threats of landslides, storm surge and flooding remain major concerns because the storm has slowed in speed. The storm has caused power outages, felled trees and shut down roads across the state. Drone video of downtown Hilo on the east side of Hawaii’s largest island shows large swaths of the area covered in brown, murky floodwaters. Some parts of the Big Island have experienced more than 31 inches of rain, more than double the 12 inches reported Thursday morning. Taiwan – Two people have been killed and one seriously wounded after damage caused by a storm in Taiwan. A tropical depression, formed over Taiwan, triggered a massive deluge across the island. Violent waves caused five cargo ships and oil tankers to run aground off Kaohsiung Harbour. Of the 66 crew onboard the ships, 52 have been rescued so far. The Central Weather Bureau issued a rare advisory of ‘extremely torrential rain’ as the storm loomed, indicating that more than 500mm of rain was expected in just 24 hours. The alert prompted the closure of many schools and offices. 5.2 earthquake hits Antofagasta, Chile. 5.0 earthquake hits off the coast of Costa Rica. The 6.4 magnitude earthquake has struck off Lombok, province of West Nusa Tenggara, Indonesia, at 05:47 local time, on 29 July 2018, followed by 66 aftershocks with the highest of those with a recorded magnitude of 5.7. The West Nusa Tenggara administration declared a seven-day state of emergency. The earthquake has claimed at least 17 lives. 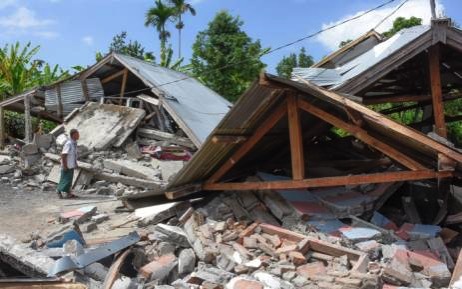 As of 1 August, the National Disaster and Mitigation Agency (BNPB) had recorded 10,062 displaced people and 5,448 destroyed houses across Lombok, most of which are located in East Lombok regency. 5.5 earthquake hits the Gulf of Aden. 5.4 earthquake hit southern Iran. 5.3 earthquake hits the south east Indian Ridge. 5.8 earthquake hits Puebla, Mexico. 5.4 earthquake hits south of Java, Indonesia. 5.4 earthquake hits the Batan Islands in the Philippines. 5.0 earthquake hits Kepulauan Talud, Indonesia. 5.3 earthquake case the island of Hawaii, Hawaii.